We have listed few of the birdwatching spots that are celebrated for bird watching tours in Nainital District. Mahesh Khan is near Bhowali , 20 km from Nainital. Maheshkhan is situated in quite and dense forest and this FRH built by Bristishers which is more than a century old is recently renovated. 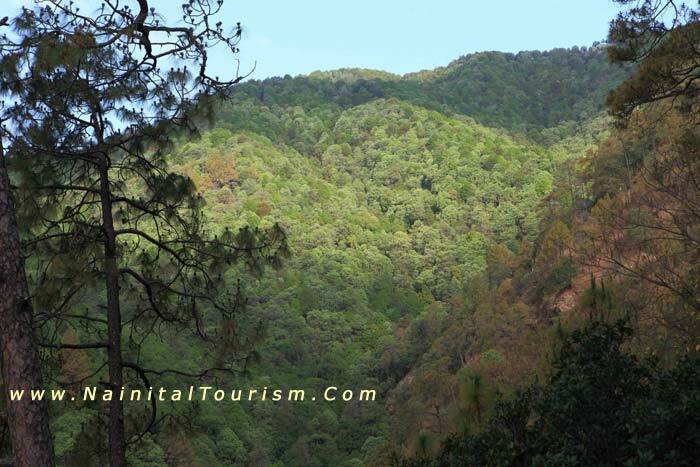 Mahesh khan is located in dense forest approx 5 km inside the bhowali ramgarh road. There is chained gate at mahesh khan jungle road entry point and mahesh khan FRH is far away. Permission is needed for entry as this area is under Forest Department. The participants spotted koklass pheasant, ultramarine flycatcher, maroon oriole, black-faced warbler, mountain bulbul, cukoo and nine species of woodpeckers. Mahesh khan has bird richness and is rated as one of the five best forests in India. Maheshkhan is amongst the 25 destinations being promoted in Uttarakhand by the ecotourism wing of the Forest Department. Apart from the heritage Forest Rest House, which recently completed 100 years, the ecotourism complex has six bamboo huts and a dining hall. Overlooking the Forest Rest House is Tagore Point, the place where Gurudev Rabindranath Tagore penned some poems for his Nobel prize winning masterpiece Geetanjali. This spot is now a major attraction for visitors, particularly Bengali tourists.